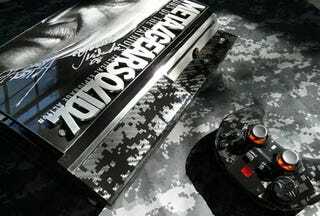 It may swerve into overly ornate territory, with its 15 LEDs that provide ample backlight beneath the raised Metal Gear Solid 4 logo and its giant Old Snake laser etching, but this custom PlayStation 3 is nothing if not complete in its customization. Not only is the thing built on a backwards compatible 60GB PS3, it's signed by Metal Gear series director Hideo Kojima and Raging Raven voice actor Yumi Kikuchi. It also comes with a custom carrying case and custom controller, features a swell Foxhound badge in place of the PS logo and comes bundled with an amazing list of stuff. Seriously, an amazing list. The MGS4 PS3, currently up for auction at eBay, also comes with: • A GA-KO Alarm Clock • The Complete Four Bottle Set of Revive 24 energy drive with all Four Limited MGS4 Items imported from Japan • Metal Gear Solid 4 Special Edition T-Shirt • Custom Embroidered Otacon Patch • Custom Made Fox Hound Vinyl Decal • Hardcover Limited Edition MGS4 Strategy Guide with Solid Snake Lithograph • World Tour - Launch Day Dog Tags • Custom made full size Fox Hound Hardcase for the PS3 and Accessories The package is so good, it gave Kojima an "O" face at a New York City signing event. Check the auction for proof! Bidding is currently well over $2,500 at time of publish. Check the gallery and you might see why.